By Adele Slaughter, Spotlight Health, with medical adviser Stephen A. Shoop, M.D. Over the past 60 years, Art Linkletter told us that kids say the darndest things. Now the Emmy award-winning performer is speaking up about aging and keeping your brain healthy. 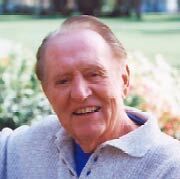 Art Linkletter advocates keeping mental fitness a priority later in life. "We know that the brain continues to grow just like everything else in the body, if it is used," says the 90-year-old Linkletter. "That is why I am so active and have espoused the cause of lifelong learning — not necessarily a formal education — but whether you do a crossword puzzle or you collect peanuts from Madagascar, do something that keeps your brain active." To that end, Linkletter gives over 70 lectures every year, and even has booked a lecture on his birthday in 2012 when he will turn 100. "I go out speaking mostly to large audiences of seniors, without notes, for an hour to an hour and a half on different scientific subjects," says Linkletter. " 'Old' often means a sinking back into oneself because you don't hear as well, and you don't talk to anybody, and so you regress. And while that is not brain death, it is brain disuse and misuse." Finding ways to keep the brain healthy longer is a growing concern because people are living longer, and there is no current way to replace or repair damaged brain tissue. "Art Linkletter is a very interesting guy," says Gary Small, professor of psychiatry at UCLA. "First of all, he probably has some good aging genes, and he's an amazing man and has been active and involved throughout his life. At 90, he's incredibly sharp. He's someone who 'lives better longer,' which is the motto of the UCLA Center on Aging." One of the biggest roadblocks to healthy aging and brain health is Alzheimer's disease. Approximately 4 million Americans have Alzheimer's, and age is the single biggest risk factor for developing the disorder. Now the 8th leading cause of death in the US, Alzheimer's claimed nearly 50,000 lives in 2000. Alzheimer's develops subtly over a period of 5-20 years. It can begin slowly with forgetting small things until the memory loss becomes more frequent and interferes with even the most mundane tasks of daily living. Early symptoms of Alzheimer's are memory and language problems. Later in the disease, people become depressed, agitated, and sometimes psychotic. Eventually, patients stop talking, become incontinent, and cannot care for themselves. "Basically what you see in those who suffer from Alzheimer's is memory loss and mental impairment," says Small. "You lose your life. You lose who you are. You're physically a person, but the human being is gone." "Genetics only accounts for about one-third of what predicts brain aging," adds Small. "The other two-thirds have to do with lifestyle choices and/or the environment." "We've been studying people before they get the disease," notes Small, who authored The Memory Bible. "We've been looking at risk factors and at the earliest, most subtle evidence of what I call brain aging. The work we've done has convinced me that Alzheimer's disease is the end result of brain aging. We've got evidence that our brain begins to age in our 20s." "What we see in the brain is a loss of cells and loss of brain messengers, or neurotransmitters, specifically acetylcholine," says Small. "The drugs that work for Alzheimer's disease, like Aricept (donepezil) and Reminyl (galantamine), will increase the amount of these neurotransmitters. It doesn't cure the disease, but people can gain a year, which is very meaningful for families." "This whole matter of the brain is fascinating," says Linkletter, "This is the decade of the brain, and we've made strides we've never dreamed of before." Today, using a positron emission tomography (PET) scan, scientists can see the plaques and tangles in the brain — the evidence of the degenerated nerve cells that cause the brain to slowly stop functioning properly. Using a PET scan, doctors can identify people in the early stages of Alzheimer's and sometimes help them slow or prevent further brain damage. "Since the brain is the essence of your life, you cannot spend too much time thinking and doing something about the brain, whether it is doing games or brain exercises," advises Linkletter, "and stay away from people who are 'catastrophizers.' It's a word I made up." According to Linkletter, a 'catastrophizer' is someone who is victimized by life; a person who looks at the cup as half empty rather than half full. Not surprisingly, Linkletter insists having the right attitude is key. "I tell people not to live alone," says Linkletter. "Don't be non-communicative or non-active in everyday affairs. Have curiosity and a passion. Find a purpose to get up in the morning, stay connected with your family, community, church, political party, or anything else. When most people get old, they are not busy planning a career or saving money; they have a tendency to drift back into introspection." Physical activity – A certain amount of physical conditioning protects your brain. What is good for the body is often good for the brain. Food – There's a healthy brain diet," says Small. "Keep down the amount of animal fats you eat. If you're going to eat fat, go for the omega 3 fat you get in salmon and avocados. You want to eat antioxidant fruits and vegetables like broccoli, strawberries and blueberries. With a healthy brain diet, watch out for the carbohydrates, which can spike your blood sugar and put you at risk for diabetes." Simple carbohydrates, like the sugars found in sweets, tend to cause blood sugar spikes far more than the complex carbohydrates found in such foods as whole grain breads and pastas. Stress reduction – "There are studies showing that chronic stress affects memory," adds Small. "In laboratory animals it can actually shrink the memory centers of the brain, and humans injected with stress hormones get forgetful. Finding ways to minimize stress is important." Mental activity – "I think of this as mental aerobics, in a way, like jumping jacks for the brain," says Small. "There are animal and human studies that point to mental activity as a way of protecting those neurons and keeping them in shape." The newest form of mental aerobics can be found at MyBrainTrainer.com, a Web site that provides a collection of interactive exercises designed to enhance cognitive abilities such as decision making and memory capacity. "Another way to keep your memory intact is to use memory techniques," says Small. "My favorite one is great because you only have to remember three things: Look, Snap, Connect. First, you look and actively observe what you want to remember. Next you snap, which stands for 'create a mental snapshot;' and then, connect your mental snapshots together." Linkletter says he's feeling 'picture perfect' and maintains that he is living well longer because of his positive outlook on life. "Things happen that you cannot count on. I've had two terrible tragedies in my life," he explains "We lost a daughter through suicide 32 years ago, and my son in a terrible accident. Both calamities came out of the blue. It is going to leave you bitter or better by your attitude." "You have to be not only willing to accept change, but welcome it," adds Linkletter. "And the more you do that, the more you have a brain that is capable of functioning longer."